Barcelona´s city growth obliged it to expand beyond its own walls and expand onto the Eixample district. Since then, the management of water resources has mainly been in private hands and has grown in this way throughout the majority of towns and cities of the larger Metropolitan Area. Despite this fact, in 2010 a Barcelona court ruled that there was no public contracting situation to regulate this management. Two years on in 2012 the government of Àrea Metropolitana de Barcelona (AMB) created a mixed company as partners with Sociedad General de Agua de Barcelona (AGBAR group) to manage the urban water cycle of supply and sanitation. In 2016, the mixed partnership was cancelled by the Supreme Court of Catalonia (TSJC) due to various irregularities: there had been no reasoning as to why the mixed partnership was the better option, besides the contract was ´passed on´ -conceded without public tender- the private part of the mixed venture, and finally, the valuation of assets was tipped very obviously in AGBAR’s favor. The court ruling by the TSJC will be considered in the next months by the Supreme Court of Spain, which is under the obligation of reaching a final verdict. If this verdict rules against the mixed company, this would make a perfect opportunity to make the water system public again for the communities of AMB. Four German Cities are now Blue Communities! 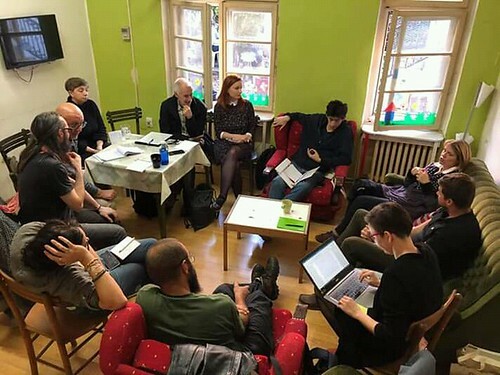 Maude Barlow, founder of the Blue Planet Project and honorary chairperson of the Council of Canadians welcomed four German cities to the Blue Communities Project this week. The Blue Communities Project is a global initiative aimed at promoting local policies that recognize water and sanitation as human rights, keep water and sanitation services public and stop the sale of bottled water in municipal facilities. The city of Augsburg voted on October 24 to become a Blue Community after a visit from Barlow earlier in the week. Augsburg is the fourth city so far to adopt the project in Germany. Municipal water provision in Augsburg dates back to 1412 when the first wooden water tours were built. The city is applying to become a UNESCO World Heritage Site in recognition of its historic public water management systems. On October 23, Barlow was in Berlin at a ceremony where Senator Regine Gunther, officially signed onto the project on behalf of the city. She was joined by Dorothea Harlin of the Berlin Water Table, Jorg Simon, CEO of Berlin Waterwork, and Christa Hecht Executive Director of the German Association of Public Water Operators. Hecht has been a driving force of the Blue Communities movement in German and was one of the main organizers of Barlow’s tour in Germany. In 2013, Berlin made history by terminating a contract with Veolia for drinking water services Veolia. The city had previously bought back shares from the private consortium RWE after many years of strong public opposition to the privatization of drinking water services. Today the German city is taking it a step further through the Blue Communities Project. Barlow was joined by the Lord Mayor of Munich Dieter Reiter at a public event at the Marienplatz. The Lord Mayor spoke out against the privatization of water and of the importance of the human right to water before officially pledging his city’s commitment to the Blue Communities Project. The city first voted in favour of the Blue Communities Project in October 2017 through the leadership of the Munich Wasser Allianz, making it the first German Blue Community. Barlow’s visit allowed for the campaign to be officially and publicly announced. The city of Marburg also voted to become a Blue Community in July 2018. As Barlow notes, the Blue Communities Project in Germany is led by local community activists who aim to send a strong message about local opposition to the privatization of water services and the commodification of water resources. Veolia, Suez, Aqualia and Aguas de Valencia were selected by the Toulouse metropolitan government in October 2017 to present their bids for two concession contracts; one for the production and distribution of drinking water and the other for sanitation. However, these four private companies are embroiled in several corruption cases for the award of public and concessions contracts elsewhere in Europe.